ABOVE: The Accademia Villa Maravege's entrance sign in Dorsoduro. INSET BELOW: A view of the Grand Canal from a hotel window. Location: Just off the Grand Canal, near the Accademia Bridge. Closest Alilaguna Airport Boat stop: Zattere. You want a moderately-priced hotel in a location that's central but away from the tourist crowds of San Marco. 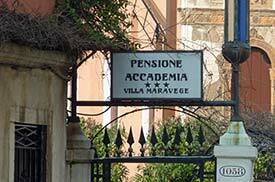 The Hotel/Pensione Accademia Villa Maravege has a loyal following among Venetophiles. The villa, which was a Russian consulate before World War II, was used for several scenes in the 1955 David Lean film Summertime (starring Katherine Hepburn). It has 27 rooms, and breakfast is served in the garden during the summer months. The top image shows the hotel's location. (Look for the garden overlooking a narrow canal just off the Grand Canal near the top of the frame.) To the right, within walking distance, are the Accademia waterbus stop, the massive Gallerie dell'Accademia art museum, and the Accademia Bridge that crosses the Grand Canal to San Marco. To the south, at the bottom of the photo, is the Zattere pedestrian promenade along the Giudecca Canal.